When John and Ashley set up the Losekola study area in March this year, they needed someone to lead the trail cutting teams. Our team-leader, Kahindo, had the experience (see the About Us page). He was called from the forest inventory work; priority was Losekola and the mystery monkeys, Lesula and Ngoyi. The blond mystery, Lesula, probably a new species. Before the path system was even finished, John saw Kahindo’s potential. In a letter he told me: “I showed Kahindo what observations we needed, how to take notes and use the camera. He is catching on fast — good — this first period is critical. Have to make as many contacts with groups of Lesula and Ngoyi as possible.” And: “Who would have thought Kahindo would be into this?” Kahindo has a reputation as the most outspoken and stubborn of team leaders. John ended a letter with, “Needless to say, such sightings send the blood of any field biologist racing.” Both Kahindo and John had their blood racing. Kahindo soon to make camp before sun set. But by June the field season was coming to an end and the priority was again field inventories. Kahindo was pulled out of Losekola and put back at the head of a team. 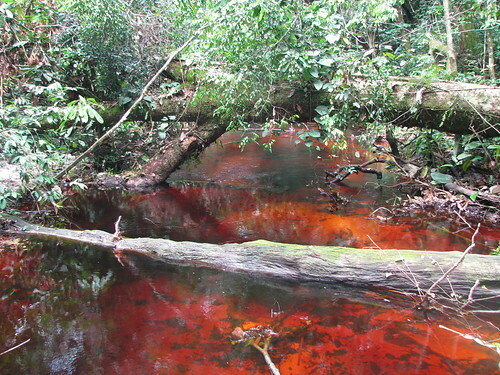 A red stream along Kahindo’s transect, through the forests of the Balanga. And clearly he had spent a long time studying the carcass of a rotting squirrel whose photo he pointed out as though it were a particular prize. This is a ready-made anatomy lesson. No further dissection necessary. Two hunters from Major Ranger’s family to whom he had given a hard time. Kahindo did not get a warm welcome in the hunting camp of relatives of Major Ranger, the Maimai we helped to have arrested. 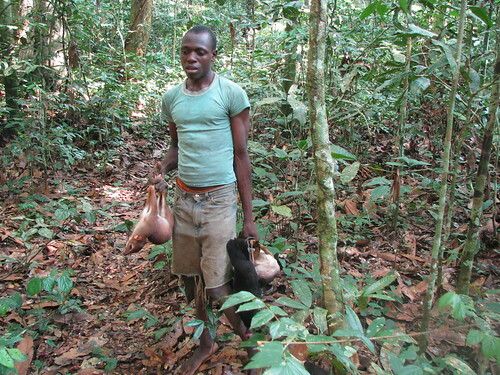 Bushmeat vendors he railed at as they passed carrying their wares towards Kindu. “You are emptying your own forests”, he rebuked the hunters again and again. A hunter is accosted by Kahindo as he returns from his snare line. Kahindo is a good team leader, but that is not where his heart is. Kahindo is now back doing what he loves best: getting the details, the minutia of the forest. 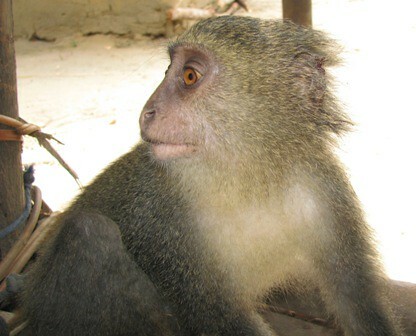 John trained him to use recording equipment and for the past two weeks he has been on his own, following the probable new primate species, Lesula. He is stalking its call tirelessly, I am certain of it. 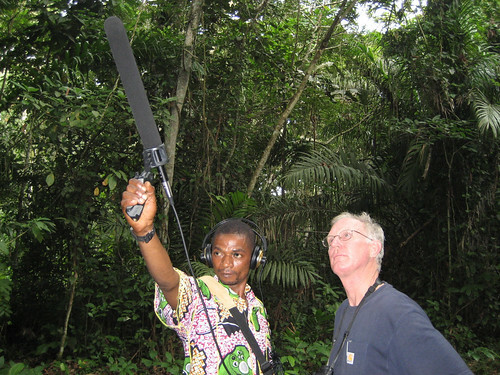 Kahindo learning to use the recording equipment in the forest with John Hart. 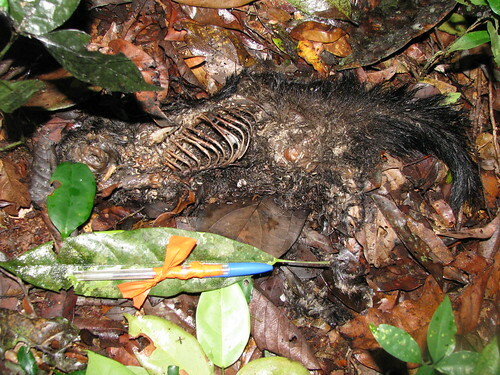 This entry was written by Terese Hart, posted on 2008-10-01 at 7:31 pm, filed under About the project, Bushmeat. Bookmark the permalink. Follow any comments here with the RSS feed for this post. Post a comment or leave a trackback: Trackback URL. Incredible red at the bottom of the rivers. Is it mineral or organic? Kim, It is probably due to the high tannic content of the leaf duff. The tannins leach into the run-off. In the second to last picture above, the one of a hunter returning from his trap line, the forest he is in is Gilbertiodendron forest. The dominant tree sheds its large heavily protected leaflets and these “bleed” the secondary compounds that turn the water red. My guess — but not sure — it that the difference between where the rivers are clear and where they are red has to do with the forest type they are passing through…whether that, in turn, reflects something else — like soil/bedrock differences — can’t say. Are there already results about this ngoyi blanc? Is it a special form of blue monkey or something new like lesula? Michael, Exactly — Ngoyi is most related to blue monkey. The first surprise was that it was where blue monkeys were “not supposed to be” ie on the left bank of the Lomami and then it just wasn’t like the blue monkeys we knew from the Ituri Forest. Maybe a variety, maybe a sub-species. Definitely will post about it when the analyses are made. Thank you Baba for giving Kahindo room and the opportunity to explore his passions, and thank you Baba for teaching him. I am so happy for Kahindo. are there large stands of gilbertiodendron forest in the losekola area? Yes, there are stands in the Losekola area, quite numerous small stands. We don’t yet understand the “logic” of where there is and isn’t Gilbertiodendron forest. But it is a BEAUTIFUL forest and its seeds are edible — by people, monkeys, elephant, buffalo, duikers, rodents and beetles!! When the Gilbertiodendron or Mbau tree is in fruit it is feast time!! I am very interested in seeing Kahindo’s photos of clearwater streams. Os this possible? Are there any fully aquatic plants growing there? It’s not exactly troubling, but the face of conservation is conspicuously white, worldwide. At times it feels neo-colonialist, imposing Western values on natives who couldn’t care less about the extinction of precious wildlife, nor about the elimination of ancient forests, preferring to exchange them for fleeting- and inadequate monies. Neither passion nor intelligence are in such short supply that so few of the familiar faces in African conservation should be black. Wealth may be perceived to be a barrier to entry, but the main difference lies in cultural attitudes toward the significance of the individual—and in the dangers intrinsic to opposing injustice alone. Kahindo has a special aptitude, and he is not easily put off. He is an invaluable resource for the future of Africa. It seems you are pleased to have the opportunity to cultivate him, but I wonder if you appreciate your obligation to protect him? 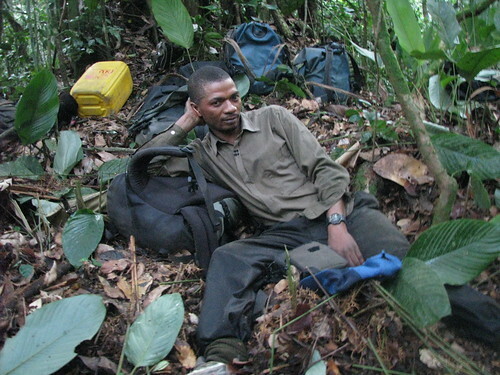 Enemies of conservation are legion in Central Africa; you have experienced this firsthand. Many are well-armed, and many are less-reluctant to take the life of a fellow African. I worry you could one day exerience this, too, fisthand. I worry you could one day experience this, too, firsthand. Oh boy, on top of the missing ﻿r‘s that reads like some sort of colourful gangster threat. I assure you, my worry is genuine. Thank you Vaff for your comments. It is true that there are a fair number of European/American conservationists. Most of the money for nature conservation in Africa comes from America and Europe as well. 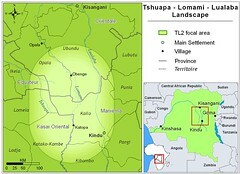 But we would be able to do very little on the ground without committed Congolese and there are quite a few. the difficulty in opposing injustice, greed and illegality in one’s own country is real. There are some new NGOs — granted with non-African directors — who are making important contributions (LAGA, PALF…). 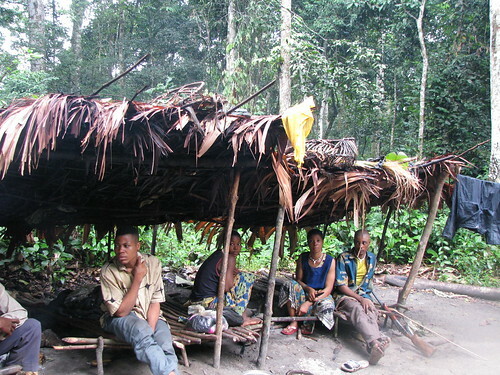 This way of working is just starting in DR Congo. It is telling though how warmly it is greeted. The lack of Law and Order is seen by many as the key problem standing in the way of development, education, opportunity…. Not just in the way of conservation.